Ja'mie undermines her relationship with her new friends; Mr. G holds auditions for his new musical; a suggestive drawing puts Jonah's irate father on the defensive. How many episodes of Summer Heights High have you seen? Jonah Takalua: Have you got your period or what miss? Summer Heights High is the best comedy since We Can Be Heroes. 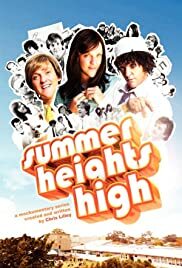 Now having just finished doing a review for We Can Be Heroes this might sound a little samey but this is a great comedy that Chris Lilley has really put his all into. The show is about 3 people at Summer Heights High. The first is Ja'mie who in this series has been transferred to Summer Heights High from her private school, Mr G the music and drama teacher who is gay but I do not think he knows it yet and Jonah the Grade 9 delinquent who has been expelled from 4 schools in 3 years. The show is not as good as We Can Be Heroes but is definitely better then a lot of shows out there and I certainly hope Chris Lilley makes a third show as he is that clever to make it good. Overall this show is another classic from the likes of Chris Lilley and this is a must watch for all fans of comedy. I rate this great show 92%.